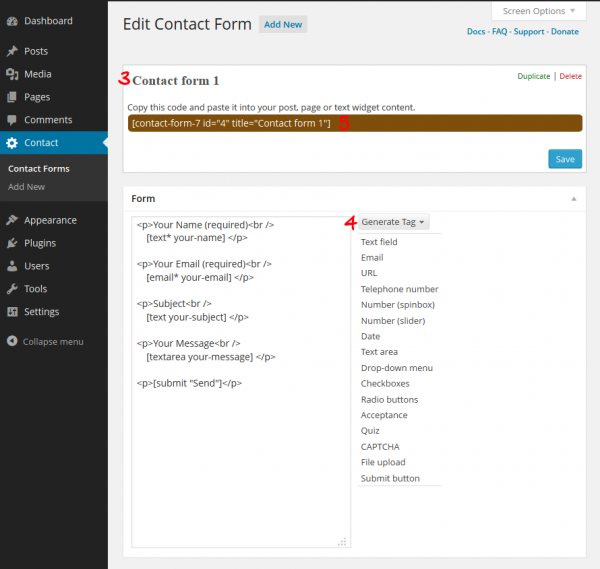 I have been using Contact Form 7 for years because it is a highly customizable and easily configurable contact form plugin for WordPress that works so well it is practically bulletproof. With over 14 million downloads in the WordPress Repository it is one of the most popular contact form solutions available for WordPress. Do you need to update the contact form on your website? 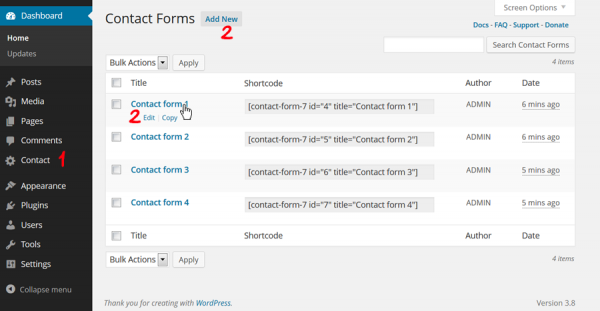 Follow the steps below to create new contact forms or edit existing ones. 1. Click “Contact” on the admin sidebar to see all the contact forms. 2. Click edit on an existing contact form or you can copy an existing form when you hover over it. Click the add new button on the top to create a new form. You will see a screen that looks like the image below. 3. You can edit the title of the form. It is a good idea to make it something easily identifiable especially once you have multiple forms. 4. The “Generate Tag” button is a dropdown menu that has options to configure the kind of element you want to add. Most of the time you will probably use a text field to have a visitor put in a name, number answer etc. Many of the other elements are useful as well, checkboxes, radio-buttons, dropdown menus and much more are available. 5. The code highlighted in brown is the code you copy and paste where you want it to show up on the website. You can put it in a page, post, widget and anywhere that accepts shortcodes. More on that later, let’s look at how to edit the form. The image below shows a text field as the element, others may differ, however the fundamentals are the same. 6. This field can be edited to control where the form sends to. You can have multiple email addresses if you put a comma after each one. 7. The code highlighted in brown needs to be copied and pasted where you want it in the form section on the left (7-1), and the code highlighted in green needs to be copied and pasted where you want it in the email section below (7-2). These sections are what the user sees and what the email sends. 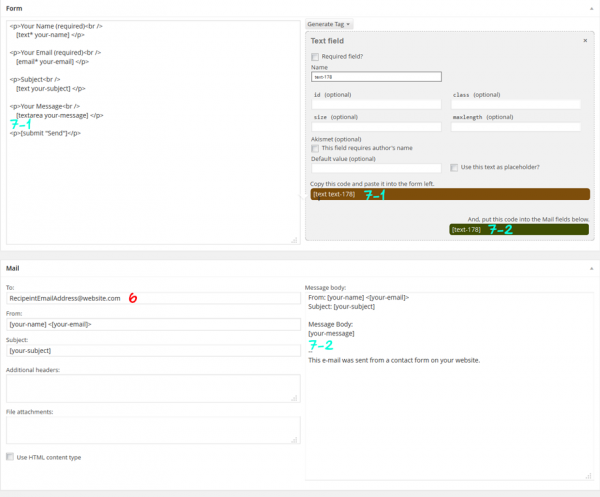 The form section respects HTML and can be styled using CSS. Save the form by clicking the blue save button on the top of the page. You can then copy ( ‘ctrl’ + ‘c’ ) and paste( ‘ctrl’ + ‘v’ ) the code in the brown box to the page, post or widget you want it to show up on. There is extensive documentation available at the Contact Form 7 website.